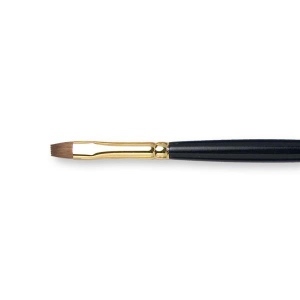 Kolibri Red Sable Flat brushes have long hair length out, which is ideally suited for painting the sharpest details with fluid paint. They are made from the tail hair of the weasel (Mustela nivalis) found in northern China. 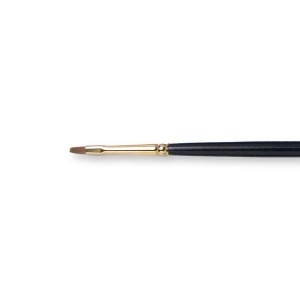 The ferrule of each Kolibri Red Sable brush receives two deep crimps. Deep crimping compresses the walls of the ferrule into the wooden handle, creating a mechanical lock that securely fastens the ferrule to the handle. The long black polished handles are made of hardwood and are lacquer finished for long life. Only the best brush handles are dipped. They are made by lowering the handles first in primer, then twice in colored lacquer and finally in varnish -- a total of four coats -- for a lustrous durable finish. For ease of handling in both a pencil or palm grip, the hardwood handles are 25 cm (10 in.) 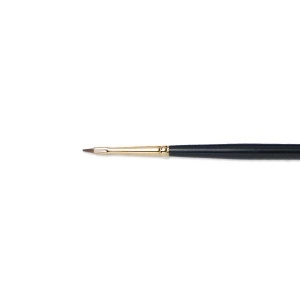 from the ferrule to handle end. The long handle permits you to stand back from the painting while working to have a better view of your subject.